Weather resistant: Quadra Cedar going strong in B.C. June 12, 2017 - Quadra Wood Products, a cedar remanufacturing company based in Abbotsford, B.C., is not unlike the wood it processes: weather resistant. The family-run company began producing siding, decking and other aromatic products in 1979 and has been through its share of storms. The first major hurdle was a fire in 1989 that levelled the facility and forced the company to restart operations in a new nearby location. To make matters worse, Quadra’s recovery from the fire coincided with the U.S. quota on softwood imports. The quota was based on previous shipments to the U.S., which for Quadra had plummeted after the fire to just 1 mbf from 30 mbf a year. For five years the company was limited to producing for the U.S. market at a reduced rate. “We had to diversify,” says Quadra Cedar sales manager Cal Dyck. The strategy led them to find new markets, both locally and in Asia, and to produce new products that were exempt from the quota. Today, Quadra Cedar is holding strong in the B.C. remanufacturing industry, producing 15-18 mbf of cedar products a year, bringing in between $15 and $18 million in sales. In spite of the ever changing and challenging cedar market place, Quadra Cedar Products, the company’s distribution side, has managed to secure long-term contracts, as well as maintain its long standing loyal customer base. 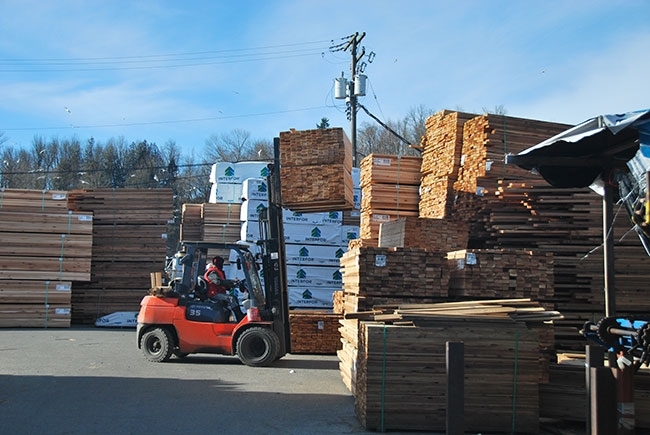 Quadra purchases raw, random length Western red cedar lumber from various major sawmills and produces approximately 150 SKUs of siding, fencing, decking, facia, 4×4 and 6×6 timbers, and paneling. Since the products are so diverse, the production line changes significantly depending on the cut, Dyck says. It’s only with years of experience that the operators are able to change over product lines in an hour, on average. 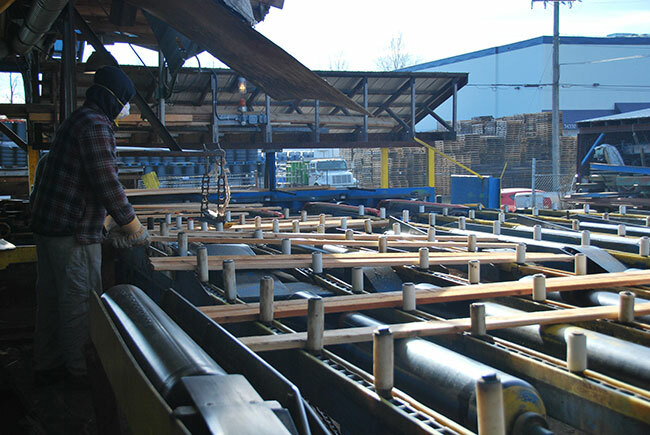 Siding, one of the mill’s main products, will start with rough, tight-knot, two-inch lumber fed into the mill’s trim line to be trimmed for defects. From there the lumber goes through one of the mill’s two Stetson-Ross planers to receive dressing and then is dropped through one of two McDonough resaws and is split into two one-inch pieces. “So if we’re running 1×8 channel siding, for instance: two inch through the trim line, two inch through the planer, then it drops into the belt for the resaw, gets split into two pieces of 1×8 and then comes out to be graded and piled,” Dyck explains. There is a bypass for the siding line as well, which goes through the Newman KM16 trim system to cut to the order length before being graded and piled. Fencing begins with two-inch rough that can be anywhere from eight to 20-feet in length. The lumber is first fed into the planer, then sent up through the trim saws and is cut to length. Next is the resaw, and then grading and piling. There are 24 sorts for fencing according to the different grades. Some of those are rip grade, which requires further processing to remove wane or defects. Other products are treated with one of the mill’s two moulders – a Weinig moulder and a Wadkin moulder – and two dog-ear machines. Some products end up in the drying facility, which uses a fan system to dry the lumber to 15 per cent average moisture content. Quadra then stores the SKUs in one of two 6,000-square foot fully enclosed warehouses. The mill’s residuals, sawdust and ends are sold to a local shavings company that processes biomass fuel as well as mulches, sawdust and shavings for farming, ranching and landscaping uses. Such is the case with most Quadra employees. Its seasoned workforce has meant low turnover for the company, which allows Quadra to consistently produce a quality product on a daily basis. “The majority of our staff has been here for a long time, so when we need to replace the odd person or expand our staff, we rely on current qualified personnel to set the tone and train all new staff accordingly, “ Dyck says. Quadra, as with all Canadian mills, is facing the reality that is duty on softwood lumber shipped into the U.S. from Canada. In early February, when this interview took place, the mill was just beginning to slow down production in anticipation. Dyck says he expects the duty will force Canadian cedar mills to find other markets, which could mean U.S. customers may lose access to a portion of Canadian cedar products if the market is unable to bear the potential increase in price. It’s not an easy time to be in the lumber business, he says, but the future is still bright for Quadra Cedar. “I still believe there is going to be opportunity. We’ve got a very strong foothold in the Canadian market. We have an extremely loyal customer base across the globe and we have a very good reputation for providing a high degree of quality and service to all the markets we are in. “We realize that we will most likely continue to be faced with the ongoing challenges in the lumber business, but continue to have confidence that we will always find a silver lining,” Dyck says. “Sometimes there are mill closures, sometimes people change careers, but the strong survive and we think we are still one of the strong ones. “My attitude in anything I do has always been that tough times don’t last, but tough people do,” he says. 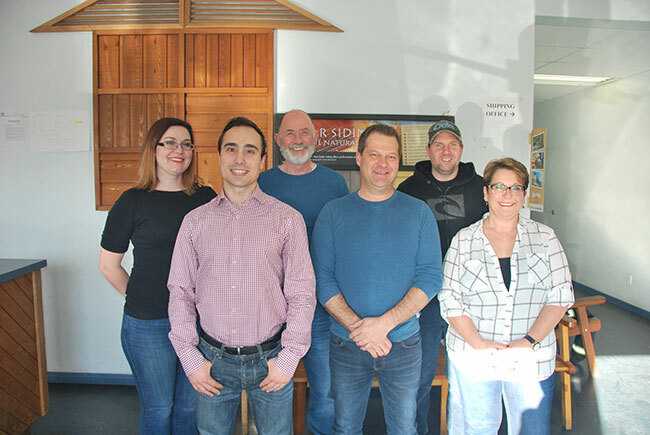 Quadra Cedar has all the right resources, staff and experience to fend off yet another potential obstacle in the ever-changing lumber business, Dyck says, and will continue to produce a quality cedar product shipped on time to its customers for many years to come.